Regen / newgen players are generated by the game to enable you to keep playing indefinitely as real footballers retire. It’s not uncommon to find regens with amazing abilities that is almost unreal (pun intended). The problem is that the best of those players will end up in big clubs because you have a disadvantage compared to AI managers; they know everything about the game’s database and you don’t. So how can you find out about those newgens the moment they are generated by the game? How can you steal them before they go to the big clubs? The answer is two words: YOUTH INTAKE. Knowing the dates that regens from certain countries are generated, takes away the AI advantage and let you play on level terms. You will know exactly when to send your scouts to scan a certain nation to discover the next generation of raw gems that will take the football world by storm. 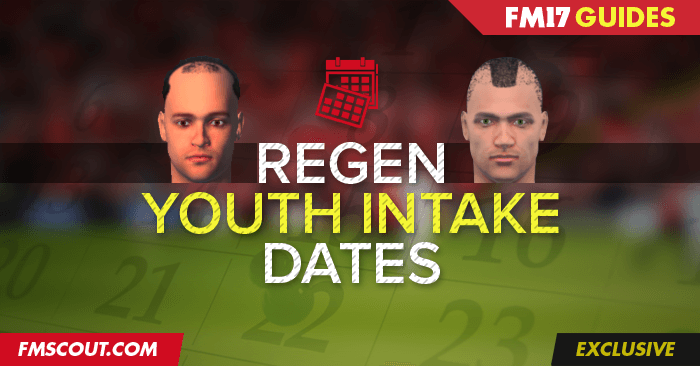 I’ve loaded the entire database of 324,000 players and holidayed 10 years into the future in order to find the regen youth intake dates for FM 2017. The dates listed below reflect only the first season (2016-2017) from October 2016 until September 2017. I’ll be updating my list once I find time to collect data from more seasons. Anguilla, Antigua & Barbuda, Aruba, Bahamas, Barbados, Belize, Bermuda, Bonaire, British Virgin Is., Canada, Cayman Islands, Costa Rica, Cuba, El Salvador, Guatemala, Honduras, Jamaica, Martinique, Montserrat, Nicaragua, Panama, Puerto Rico, Sint Maarten, St Kitts & Nevis, St Lucia, St Vincent, Surinam, Trinidad & Tobago, Turks & Caicos Is., US Virgin Is. If you spot a mistake or if you want to help me out (by sending me data from more seasons), either post a comment or send me a private message. I am a lower league club and can not scout any of these league, whats the best way to try and get a regen that I can sign and then eventually sell on? This is great info and makes a huge difference to finding talent. However, how do you optimise scouting settings to get hundreds and hundreds/ thousands and thousands of reports back very quickly? I have 15 scouts but only receive about 50 scout report cards every 2-3 days with my current scouting set-up. I currently have over 18'000 youth intake players queued up and will never get through them at this rate! Thanks man , I am waiting for updates on next seasons.